Seminyak 28 is completely located beside the river between Legian and Seminyak area. Just about 5 minutes drive to Legian or Seminyak Beach and about 8 minutes drive to Kuta Beach. It’s just a perfect location if you want to spend your holiday around Kuta, Legian, Seminyak and Petitenget area. 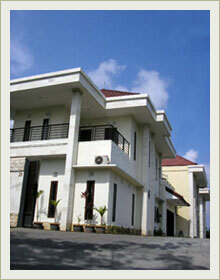 Our complex consists of three brand new villas. Each villa is a three and one bedrooms villas. Each villa is completed with private bathroom in the master bedroom, shared bathroom for other two bedrooms, hot and cold running water, air-conditioned, one small room completed with toilet for maid, two living rooms; one on second floor and one on first floor, each completed with sofas and television sets, a kitchen with stove and sink and completed with microwave and refrigerator. Each villa also completed with a car port. If you are traveling in a group of 4 - 8 people, our villa could be one of the best alternatives. Instead of staying in a hotel where rooms can be far apart from each other and more expensive, you can spend more time together by sharing a villa.